Traditionally, banking hasn't always been the most exhilarating activity – it was just something you had to do. Thanks to free Kasasa Tunes®, those days are long gone. Not only is this account free, it also pays refunds on iTunes®, Google Play®, and Amazon® purchases. 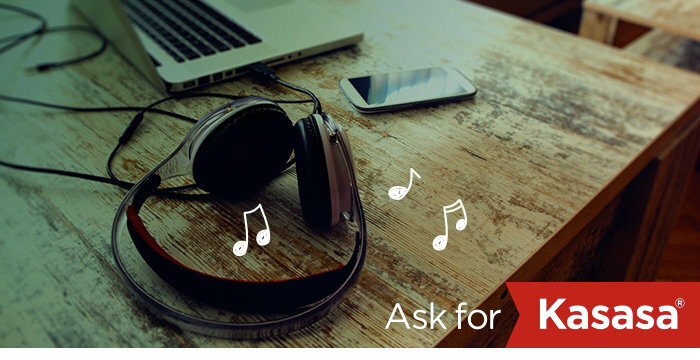 You heard that right — money for music, movies, apps, and more! On top of that, you also receive ATM fee refunds nationwide! * Don't just settle for any old account. Get one that's suited to your lifestyle. Now you're ready to rock! And if for some reason you don't qualify one month, no worries. Your account is still free. You can get back to earning your full rewards the very next monthly qualification cycle. View our 2019 Qualification Cycle Dates. Mistakes happen and sometimes there are not enough funds in a checking account to cover all the debits. Protect yourself with our overdraft protection options. *Sign Up Bonus: When you open and fund your Kasasa Tunes account, you will be refunded up to an aggregate total of $20 (which includes any applicable taxes) for iTunes, Amazon.com, Google Play purchases, made with your Kasasa Tunes debit card that post and settle to your account during the first 60 calendar days after your account is opened. This refund will be credited to your account on the last day of the current statement cycle in which your aggregate iTunes, Amazon.com, Google Play purchase threshold of $20 posts and settles to your account. Any portion of the Sign Up Bonus that is not used within the stated time period will be forfeited. No minimum deposit is required to open the account. No minimum balance is required to obtained this bonus. Qualification Information: Account transactions and activities may take one or more days to post and settle to the account and all must do so during the Monthly Qualification Cycle in order to qualify for the account's rewards. The following activities do not count toward earning account rewards: ATM-processed transactions; transfers between accounts; debit card purchases processed by merchants and received by Atlantic Financial Federal Credit Union as ATM transactions; non-retail payment transactions; Online Bill Payment transactions; and purchases made with debit cards not issued by Atlantic Financial Federal Credit Union. Transactions bundled together by merchants and received by our institution as a single transaction count as a single transaction for the purpose of earning account rewards. "Monthly Qualification Cycle" means a period beginning the last business day of the month prior to the second to last business day of the current statement cycle. Reward Information: When Kasasa Tunes qualifications are met during a Monthly Qualification Cycle: you will earn up to an aggregate total of $10 (which includes any applicable taxes) in refunds for any iTunes, Amazon.com or Google Play purchases. In order to be refunded, iTunes, Amazon.com,Google Play purchases must be made with your Kasasa Tunes debit card and must post and settle to your account no more than 30 days after the Monthly Qualification Cycle in which you qualified ends. In addition, you will receive reimbursements up to an aggregate total of $20 (max. $4.99 per single transaction) for nationwide ATM withdrawal fees imposed by other financial institutions and incurred during the Monthly Qualification Cycle in which you qualified. An ATM receipt must be presented for reimbursements of individual ATM withdrawal fees of $5.00 or higher. We reimburse ATM withdrawal fees based on estimates when the withdrawal information we receive does not identify the ATM fee. If you have not received an appropriate reimbursement, we will adjust the reimbursement amount if we receive the transaction receipt within thirty (30) calendar days of the withdrawal transaction. When Kasasa Tunes qualifications are not met, iTunes, Amazon.com, Google Play purchases and ATM fees are not refunded. iTunes, Amazon.com, Google Play refunds and ATM fee reimbursements will be credited to your account on the last day of the current statement cycle in which these purchases post and settle to your account and the ATM fees were incurred. Rewards are variable and may change after account is opened. Additional Information: Account approval, conditions, qualifications, limits, timeframes, enrollments, log-ons and other requirements apply. No minimum deposit is required to open the account. Monthly enrollment in online banking and receipt of electronic statements are a condition of this account. Enrollment in electronic services (e.g. online banking, electronic statements, and log-ons may be required to meet some of the account's qualifications. Limit one (1) account per social security number. There are no recurring monthly service charges or fees to open or close this account. Contact an AFFCU representative for additional information, details, restrictions, processing limitations and enrollment instructions. Federally insured by NCUA. iTunes is a registered trademark of Apple, Inc. Amazon.com is a registered trademark of Amazon.com Inc.. Google Play is a registered trademark of Google, Inc. Apple Inc., Amazon.com Inc. and Google, Inc.is/ are not participants in or sponsors of this program. Kasasa and Kasasa Tunes are trademarks of Kasasa, Ltd., registered in the U.S.A.